The Model PHB-357 microprocessor-based, benchtop meter brings very accurate pH and mV measurements to the laboratory. Useful design features include automatic buffer recognition, automatic calibration, recorder output for permanent recordkeeping, splashproof keypad to prevent damage from spills, display hold function and 9 V battery memory back-up. With 0.1 mV resolution, this versatile instrument can also perform ion selective measurements. It operates on either 115 Vac line power or a 9 V battery. Supplied with the PHB-357 meter is an epoxy-bodied general purpose pH electrode, a temperature probe and an ac power adaptor. 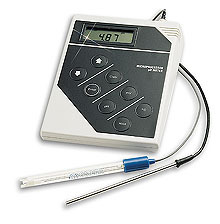 참고: Includes meter, epoxy-bodied general purpose pH electrode, temperature probe, ac adaptor, and operator’s manual.